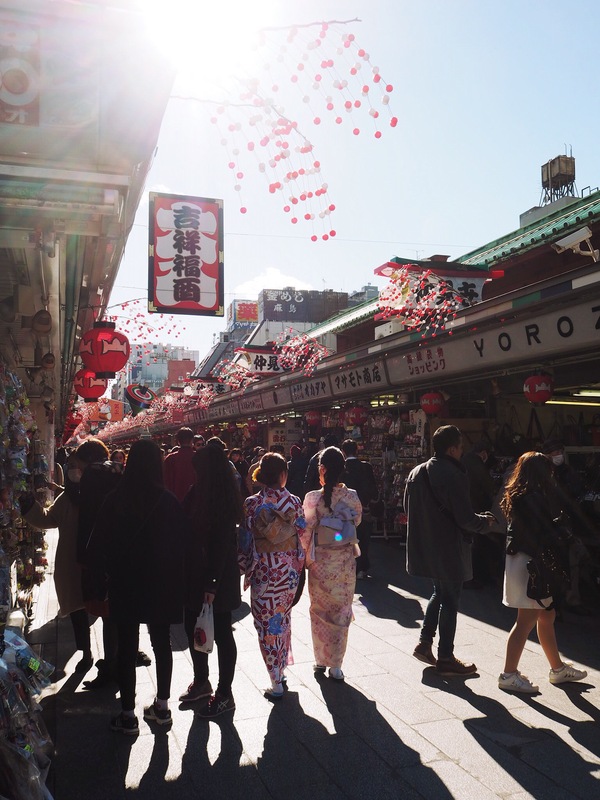 Japan: Tokyo – Sometimes the wrong train will get you to the right place. We arrived in the outskirts of Tokyo after our long trip from Sendai. 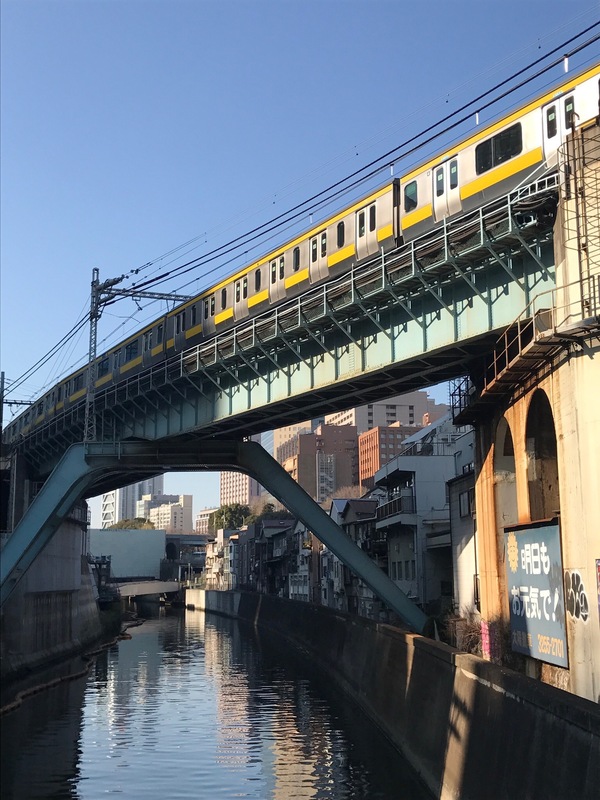 We made our way to our hostel in Asakusa via a long, cross city subway ride, got a couple beers, and called it a day. We spent our second day walking, quite a bit, around town. 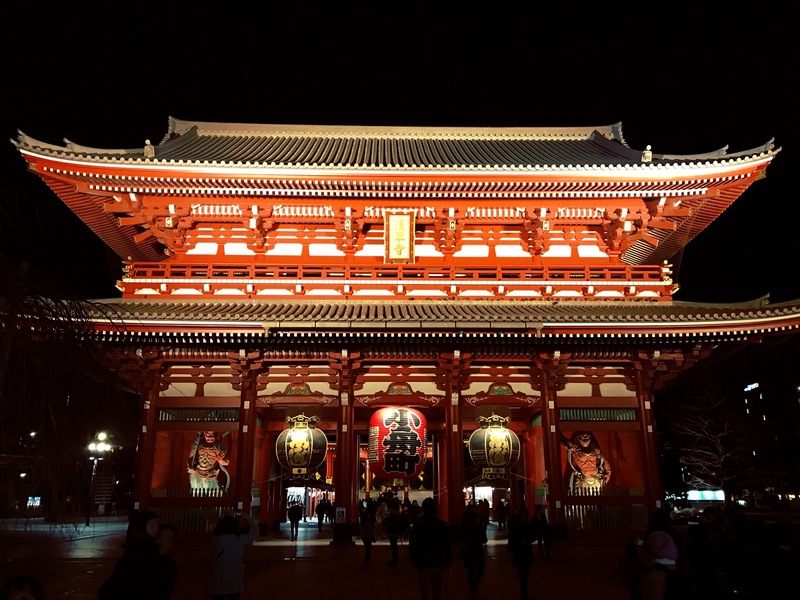 Our first stop was the Buddhist temple, Senso-ji, in Asakusa, only several hundred meters from our hostel. We read our fortunes from the kau cim, and were pretty bummed out about the dismal prospects they gave us, so we figured we’d test the system and go back every morning and average the results. That’s how fortunes work, right? 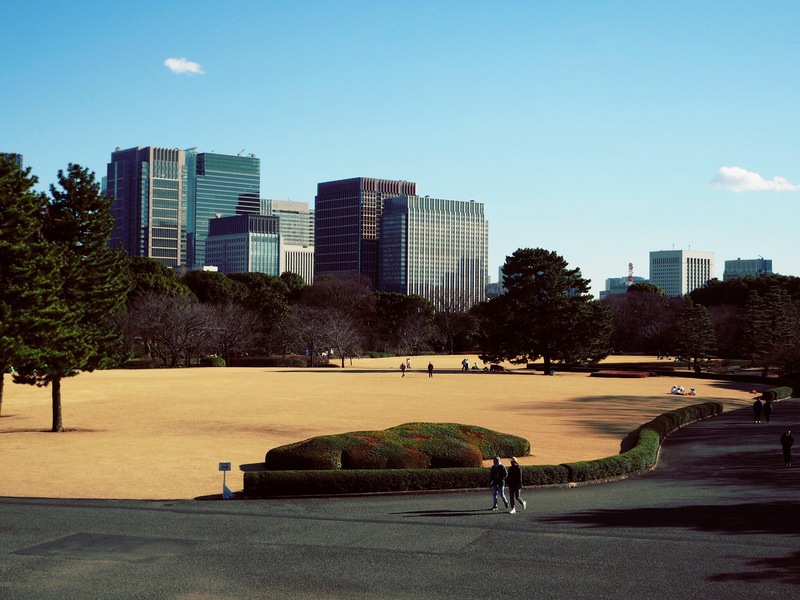 The weather was beautiful, so we spent some time wandering the east gardens of the Imperial Palace, which were free, so why not? 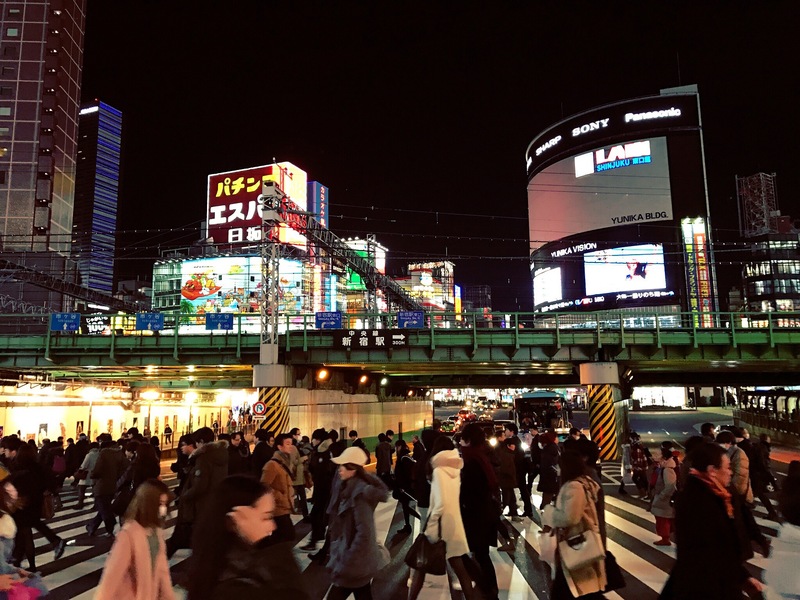 It became quite boring after awhile though, so we headed to Shibuya, which is the antithesis of the calm of the gardens. We dissolved into the teeming masses and wandered the streets for awhile, and eventually got some dinner. Many thousands of steps later, we went to a French bakery and found the elusive kouign-amann. The pastry from Breton was delicious, but having nothing else to compare it to (they’re quite hard to find outside of France), we vowed to visit the region at some point and try the real thing. 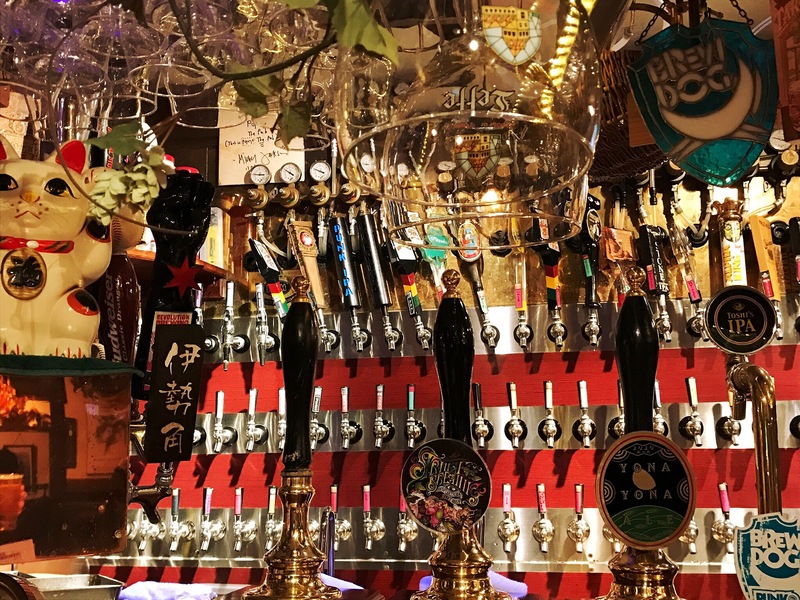 That night we visited Popeye, a beer bar with some 70 taps, and tried a few delicious, but absurdly expensive beers from various places around the world. The atmosphere of the place surprised us, as we were expecting something a bit more modern. Instead, it was dingy and quite old fashioned, and the clientele was mostly businessmen in suits. Nevertheless, not a bad place to swill down some great beer. Our third morning certainly bore witness to better fortunes, and instead of the worst we got the best. But considering the average that basically puts us at square one, with the next draw being the tie breaker. After the temple we headed to the artificial island of Odaiba in the Tokyo bay. 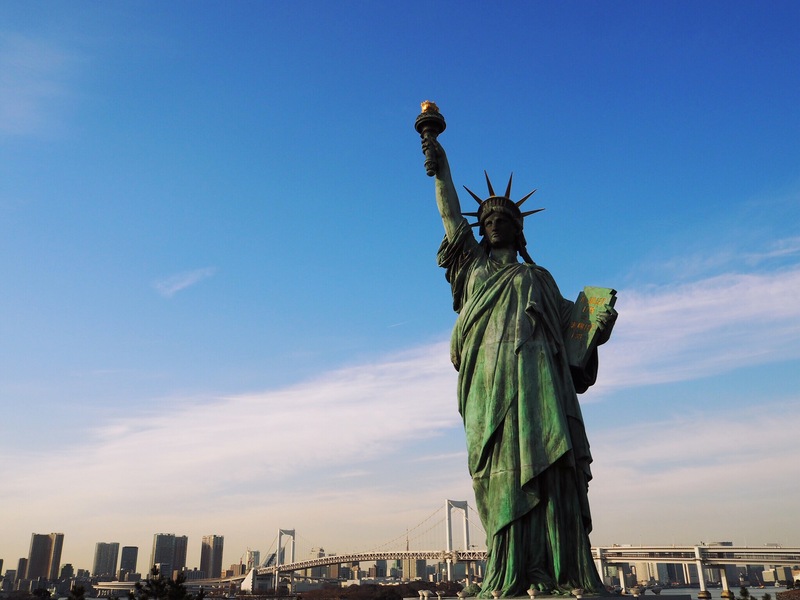 It’s seen a lot of development recently and is now a pretty big shopping destination with some strange attractions such as a replica of the Statue of Liberty. 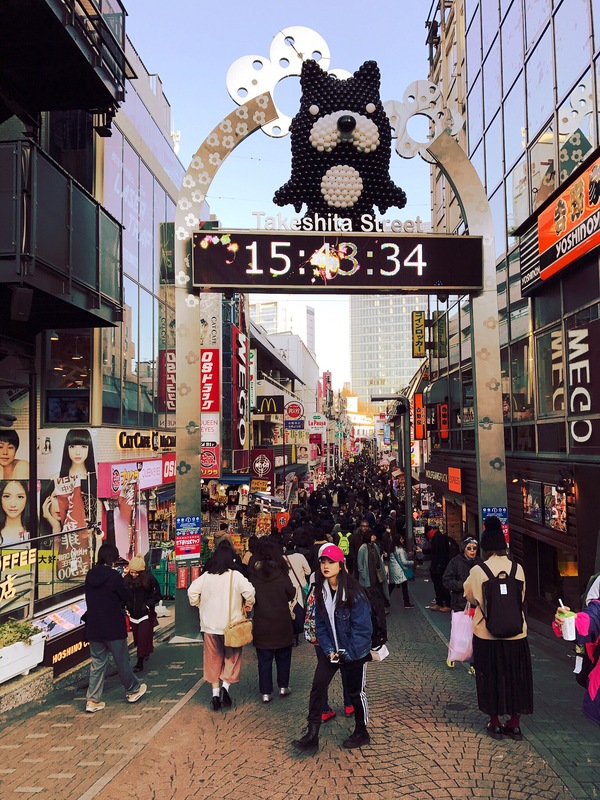 Architecturally, the area is quite interesting, with masses of modern and bizarre building features like office buildings built in the fashion of a huge arch or giant spheres suspended among structural girders. We finished off the night at the Don Quixote department store (if that’s what one should call it) in Asakusa. It’s a giant, multistory affair that’s open 24 hours and sells practically anything. We stocked up on some groceries, booze, and various other items we thought we needed. The store is a sight to behold in itself, and it was absolutely packed even at 10pm. The main clientele seems to be foreigners, and there was a dynamic mix of Indians, Southeast Asians, Koreans, and Chinese. There was a tax free counter with some arcane rules that everybody seemed to want to go to, so we waited in line for almost an hour, somehow concluding that we’d be saving tons of money. As it turns out we were refunded some $7, which definitely did not feel worth it in hindsight. The following day we took a Japanese baking class as Ian’s Christmas gift to Oona. We showed up, as per instructions, to the teacher’s apartment just west of Shibuya. 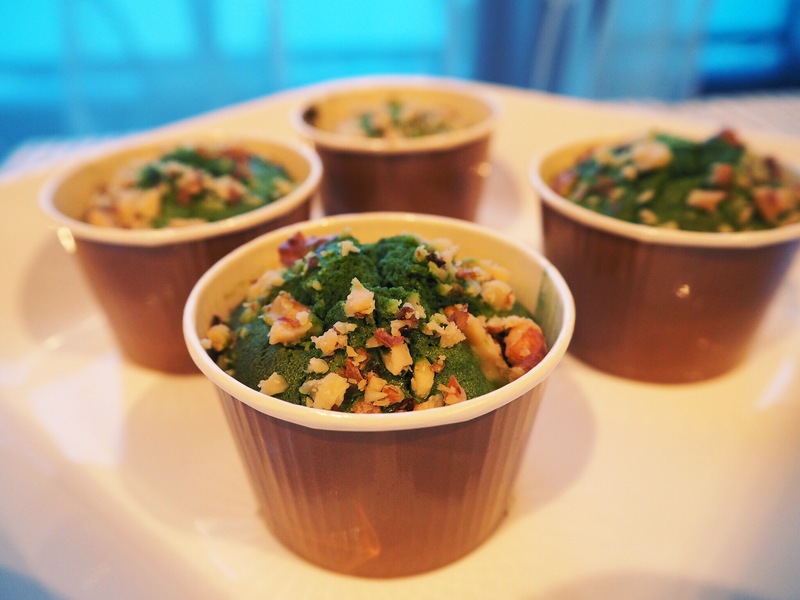 She showed us some neat techniques, and we baked a macha roll cake and macha brownies. 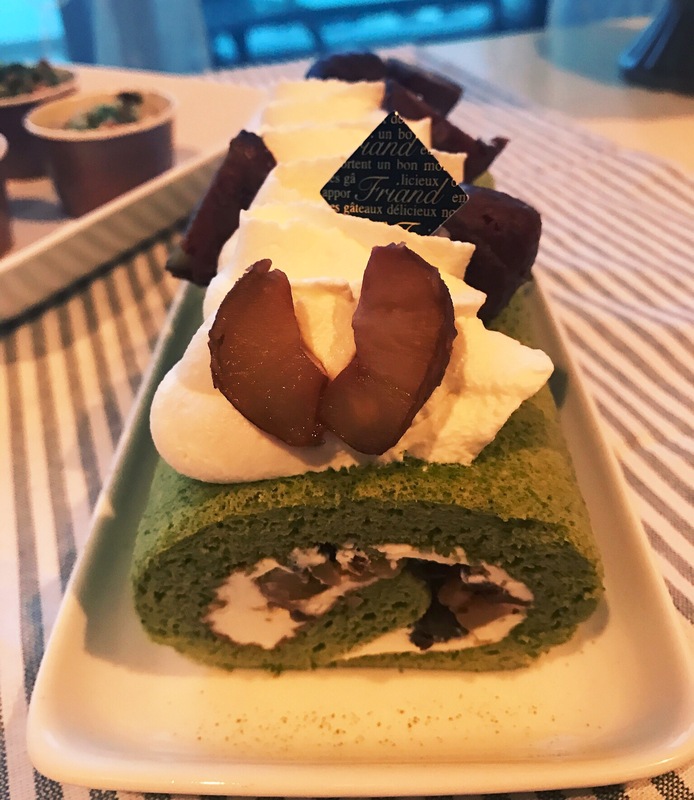 Japanese baking, as it turns out, is quite exact though, with the recipes calling for “92 grams of egg”, for example, which needed to be measured out to the gram. The cake was delicious, and the view from the apartment was pretty spectacular as well. Macha brownies, definitely not as good as the cake. After the baking, we had worked up a serious hunger, not satiable by sweets, so we headed to the infamous Piss Alley. 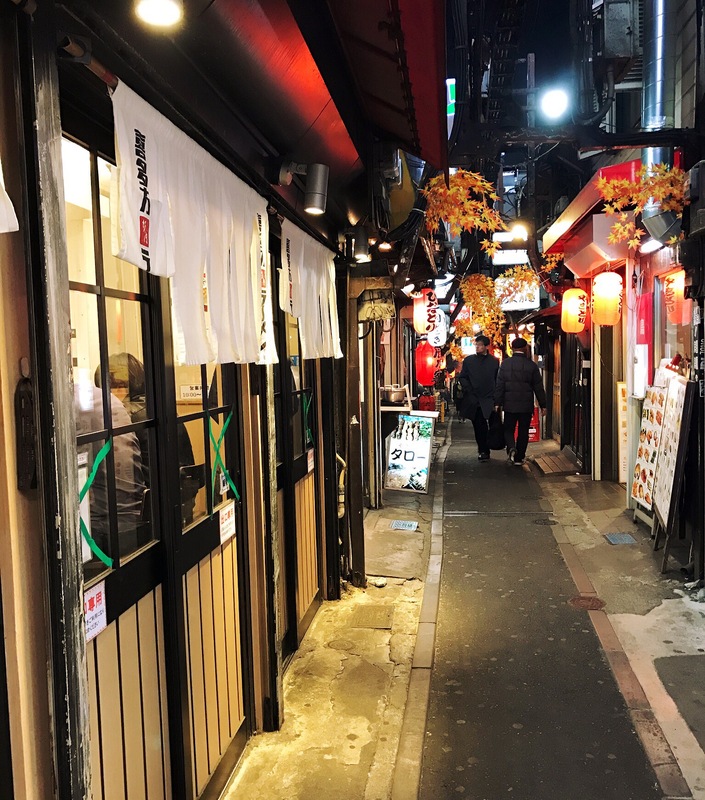 It sounds like a questionable place to get food, but the yakitori shops lining the alley serve some of the best in town. 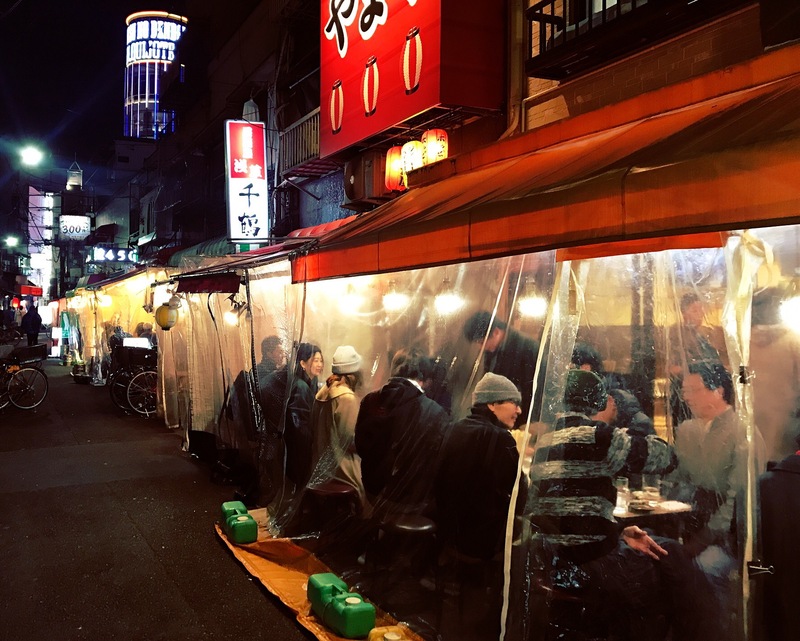 The name apparently comes from the olden days when the alley was a popular drinking spot, and maybe when Japanese manners weren’t so strict. 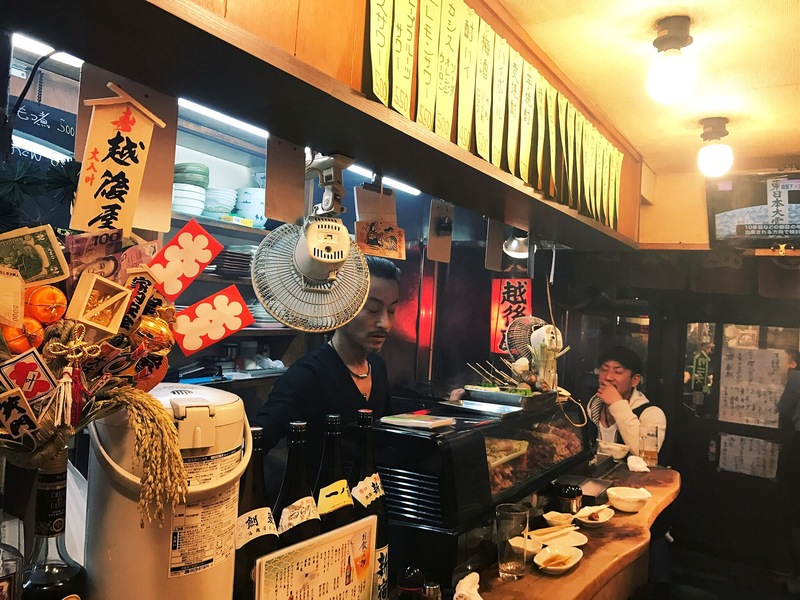 At any rate, we chose a random izakaya, sat down at the narrow bartop and downed some beers and yakitori. We’ll call it Yakitori Alley instead. Izakaya, complete with local drunkard. That night many of the hostel guests gathered at the hostel’s bar for a jazz performance. 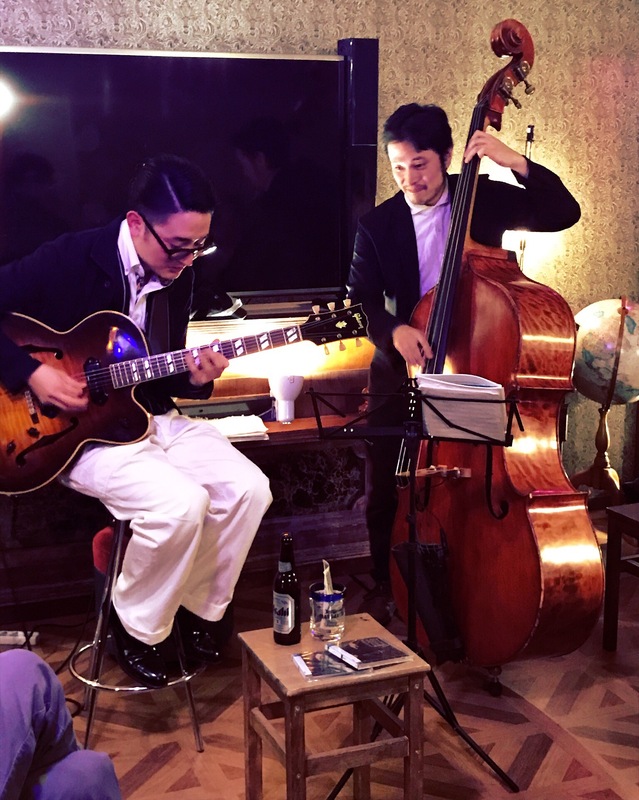 The two piece band consisted of a guitarist and a bassist, but the seemingly-incomplete unit stunned the audience with their virtuosic mastery of the instruments, jamming out to some bebop and cool jazz. The bar’s intimate surroundings were packed with people, and a good time was had by all. That wasn’t the end of the night, though. About 25 of us managed to somehow coordinate ourselves over to the karaoke joint a few blocks away. Payment for that many people proved to be a bit of a task, but we ended up securing a room for us all, with a nice view of the Skytree to boot, with unlimited drinks flowing until 4:30am. A raucous good time was had, but the original gang of 25 dwindling to a mere shell by the wee hours of the morning. By 4:30 there were only five of us, and we stumbled out into the cool air to find our way back to the hostel. We awoke with a bit of a hangover, but we supposed that the very Japanese experience of the night before was worth the small sacrifice. Plus, with the cloudy weather of the day only a few museums were on the agenda. 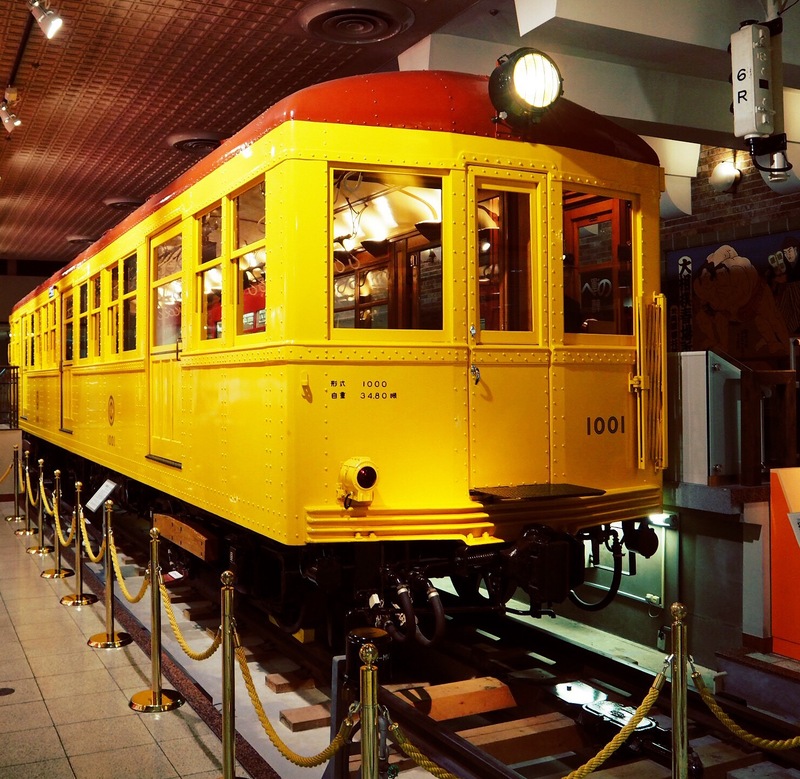 As it turned out, only one museum was visited, and that was the Subway Museum. Not as interesting as Ian hoped, and was (predictably) mostly geared towards kids, but there were some interesting historical notes as well as real bits of train control mechanisms that could be operated. As good little tourists, we had grand plans of visiting a town near Mt. Fuji for a daytrip and some photography, so the following morning we headed to Shinjuku station only to learn that the buses were totally booked up until 4pm. We went downstairs to check the train schedules, and in-line with Japanese expectations, a round trip ticket would have put us back nearly $80 per person, so we opted not to. Instead, we got some Kobe beef ramen from a nearby shop. It sounded like a tourist trap, but the place was crowded with locals, which we supposed was a good enough sign. The ramen was great, and the meat was certainly the highlight, but perhaps not worth the $25 price tag. 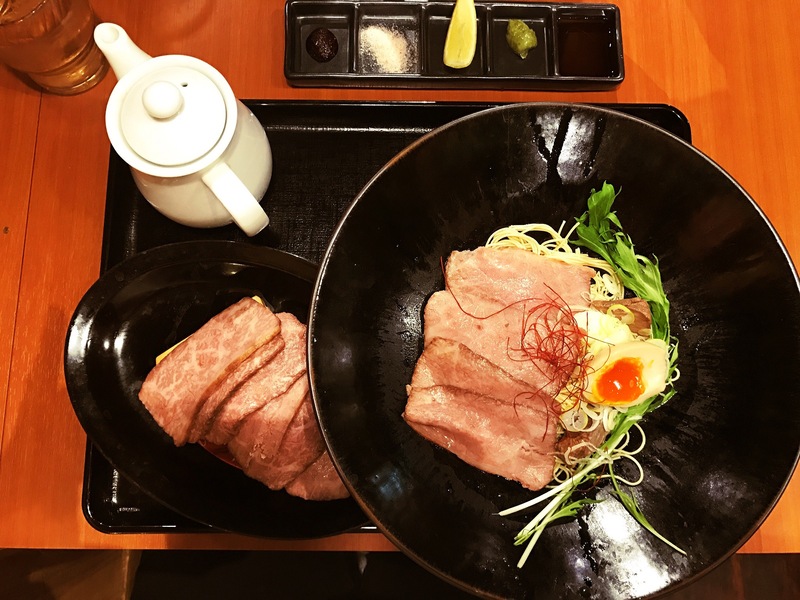 But, having Kobe beef is something of a thing to do in japan, and it seemed a wise move to splurge on it once before our departure. Instead, we spent some time at the National Art Center, whose 10 year birthday it was, so admission was free. We wandered the musem for a bit, but found the crowds unappealing and were generally not in a museum-perusing mood. 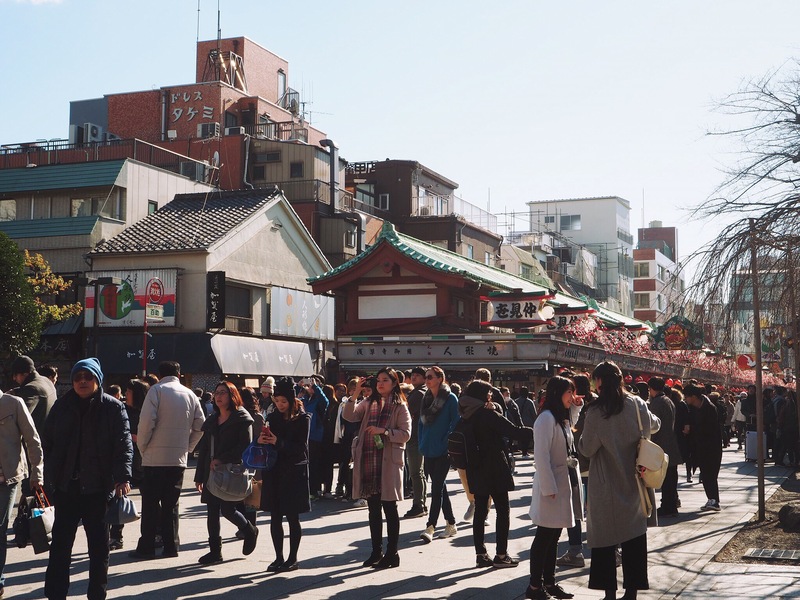 We skipped out on the museum and ended up wandering Harajuku’s jam-packed streets for awhile. As we were running out of energy, we settled on a cafe on the top floor of a shopping center in Harajuku. As we were sitting down, Mt. Fuji was perfectly framed between a few buildings out the window with the setting sun directly behind it. Who needs an $80 train trip anyway?! As we sat in awe, however, we neglected to take a photo, so we have no proof, aside from a rosy memory, that this actually happened. 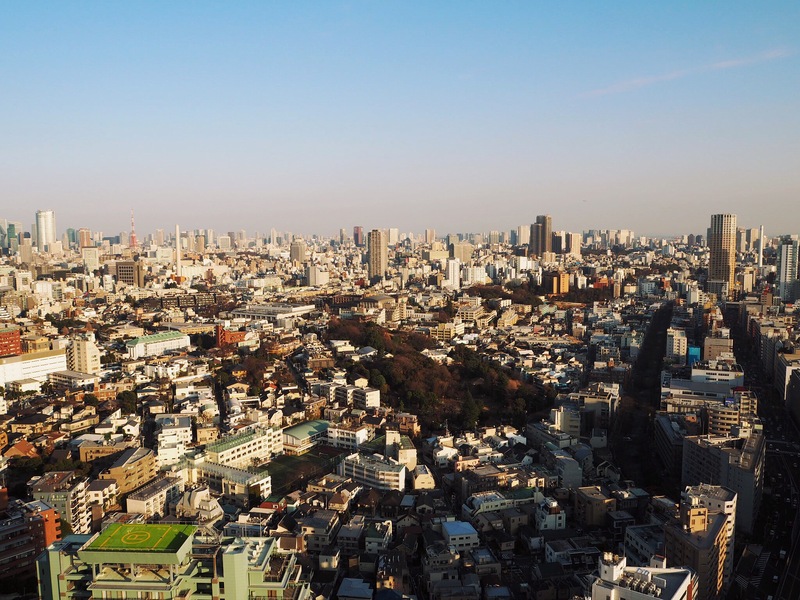 Our flight out of Tokyo was the following night, so we had basically the whole day to spend. 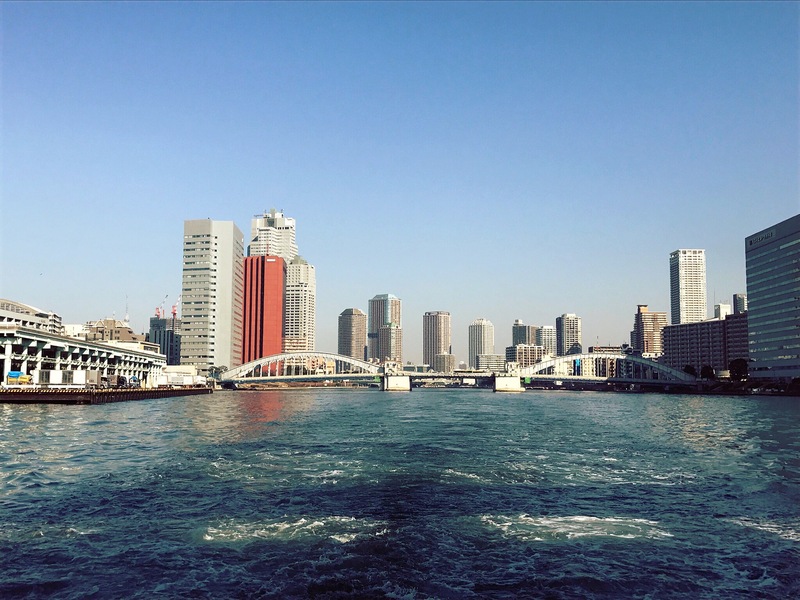 We ended up taking a boat tour from Asakusa down to Hinode Pier. It was reasonably-priced at about 700¥ per person and a fairly nice way to spend an hour or so on a nice day. 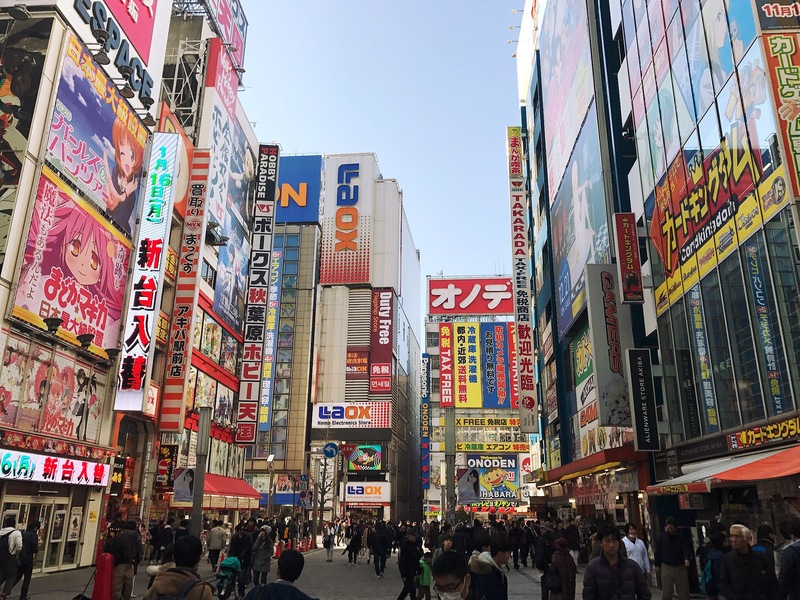 After the boat tour we made our way to Akihabara and wandered around the streets for a bit. We spent some time exploring a new design market underneath the railway viaduct and next to the canal there. There were lots of nice little shops and a few restaurants. We finished the day off with some craft beer from the Kiuchi brewery pub. At this point it’s worth mentioning a rather drastic change in our plans. We were originally planning on going to Hawaii, then to Alaska, and then making our way down through North America into Central and South America. Since we’re running a bit low on money at this point, and perhaps a bit low on tolerance for more cold weather as well, we’ve decided to skip this segment of our trip. This means that we’ll be making our way, somewhat slowly, from Hawaii towards Australia instead. After Hawaii, we’ll be making stops in Samoa and Fiji before exploring more of Oceania and the Pacific Islands. Ideally, our trip will end after visits to Southeast Asia and southern Africa, perhaps six to eight months from now. Of course, all these long term plans are flexible as well, and subject to change just like our previous plans. One of the great motivators for this change of plans was the fact that we’ll likely be settling in the Northwest somewhere anyway, and all of the things we would have visited there this time around are very easily-visitable at any point in the future. It makes more sense to us at this point to spend our limited time and money going places that are difficult to get to. So, with that in mind, we’re preparing ourselves for the warmer climes of the places to come, and getting ready to ditch the cold weather clothes we’ve held so dear for the past four months. With all that in mind, we said goodbye to Japan, a country we had grown to love in many ways over the month that we were there for. This also marked our departure from the continent of Asia, which had been our host for the entirety of our trip so far. We will be back, but only after a several month stay in the Pacific. We departed from Tokyo Narita at around 8pm on Sunday night and after a six hour flight, arrived in Honolulu at around 8am on the same Sunday morning, which was a weird feeling. Just have your fortune taken continuously and average them all. You’ll be destined for a mediocre life then, by definition.